No, wait. Let's back up. So a few hours ago, I'm driving home from town. Listening to a month-old podcast talking about how we (Christians) are losing our kids to the culture. Listening to the solutions offered, including teaching apologetics. Feeling reasonably okay about how we've done in this regard, but still a bit uncomfortable. You know, should we be doing more? What about all that stuff I've bought and struggled to use? Okay, fast forward six or so hours. NOW I'm sitting here, poking around. And I head to the Apologia website to remind myself how much money I need to come up with so Connor can start Biology soon. And for whatever reason, I click on the Apologia Press link, not the Apologia Science link. And I find... that Apologia has teamed up with Summit Ministries (creator of the single most guilt-inducing homeschooling product I've ever purchased, Building on the Rock) and is putting out a series of books on Worldview. And it looks fabulous. It looks more than fabulous. It looks like exactly what I've been trying to find. 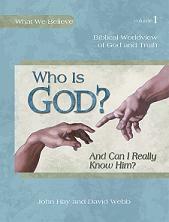 Before I read the FAQ and realized this was a joint effort with Summit, I was reading the sample chapter for Who Is God? and thinking it sounded awfully familiar. But so much easier to actually use. And the FAQ confirmed it for me... this What We Believe series is intended to be a more homeschool friendly form for the Building on the Rock materials. Like you can use it with ages 6-14 (or even older) all at the same time. And you don't have a foot thick stack of educationaleze teacher's manuals to go through. And it is written TO the student. Oh, wow. This is exactly what I have been looking for. And it is only $40 per book (only the first one is available now) instead of hundreds of dollars per level. This goes to the very tip-top of my homeschool wish list. And Apologia is a Review Crew vendor, coming up soon actually... while I'm still hoping for Biology, I'm also hoping for this. Okay, well, honestly, there isn't much that I wouldn't love to get. This sounds great Debra! I want this and a Biology one too. I was just thinking about it the other day. Doesn't this sound amazing? I'm tempted to start using the sample materials from Summit and assume I'll figure out a way to obtain the book by the time we finish those first two chapters. I have a nine year old!